In 2014 the boys team was a team in transition. In previous years the team had been loaded with experienced seniors. In 2014 with only one senior with baseball experience and a wealth of freshmen and sophomores the team had to learn the basics and gain experience on the fly. In the early going the team got off to a rough start as they lost their first two games to BWL and Waldorf. After scoring just two runs in their first two games BFS scored 16 runs in game three to defeat Kew Forest 16-4. After a non league loss to Churchill, the boys played a game against league opponent UNIS. In the most adverse environment you could think of which included sub 40 degree temperatures and rain the team played one their finest games of the year to bail down a 7-5 victory. The win pushed the Panthers’ league record to 2-1. After a win against rivals Friends the Panthers record stood at 3-1 in the PSAA and 3-3 overall.In the early going the team got off to a rough start as they lost their first two games to BWL and Waldorf. After scoring just two runs in their first two games BFS scored 16 runs in game three to defeat Kew Forest 16-4. After a non league loss to Churchill, the boys played a game against league opponent UNIS. In the most adverse environment you could think of which included sub 40 degree temperatures and rain the team played one their finest games of the year to bail down a 7-5 victory. The win pushed the Panthers’ league record to 2-1. After a win against rivals Friends the Panthers record stood at 3-1 in the PSAA and 3-3 overall.After getting the season to .500 the boys had their longest losing streak of the season as they lost three straight to LWA, BRP and ECHS. All league opponents, the skid dropped the team’s PSAA record to 3-4. In a display of grit and determination the team went on to win their final game in league play to clinch the fourth and final spot in the PSAA playoffs. Unfortunately it was a short run in the playoffs. In the first round BFS took in BRP and in doing so took a one sided loss at the hands of the eventual PSAA league and playoff champs. The team closed out the season with two more non-league wins over Lehman Prep and Elisabeth Irwin. The wins brought the final season record to 6 wins and 7 losses. The team was led this year by senior captain Adam Ginsberg and Junior captain Adam Wells. Ginsberg is the only starter to Graduate this year and Wells has made great strides in becoming a reliable ball player and captain. Along with the two captains, the starting line-up this season consisted of 4 freshmen and 3 sophomores, a young and inexperienced bunch that took great strides as individuals and as a team. I am looking forward to their continued growth over the next couple of years. The Varsity Girls softball team had another year of great success. The team finished with an overall record of 9-6. Playing in two leagues this year the team faced a lot of tough competition. 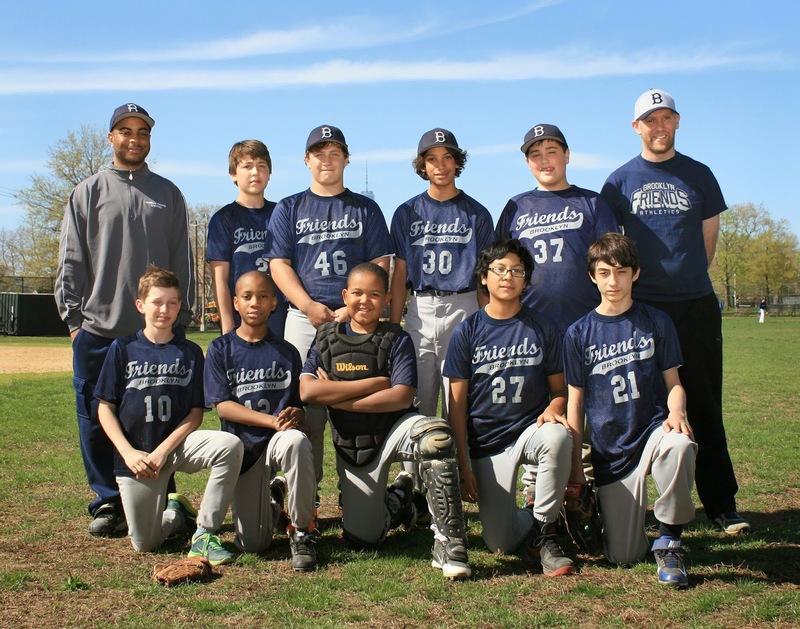 Rejoining the ACIS league the team represented BFS well on the diamond as we won our first two ACIS league games. The second win came in dramatic fashion as we won 6-5 with a walk off home run. We came up just short as we missed the ACIS playoffs by one game. In the ISAL league the the team once agin played extremely well and their only regular season loss came against LREI. The team once again made it to the ISAL Championship game (third year in a row). Unfortunately the team suffered a close and tough 5-2 loss in the ISAL championship game to LREI again. The upperclassman were a vital part in the team’s success this year and during the last couple seasons. The seniors were the leaders this year with the help of the juniors. Senior Chloe B. was the captain. She was extremely committed and played an excellent first base all season long. Senior Julia G. was the team’s best hitter. She played shortstop most of the season and when needed she filled in the role as back up pitcher. Senior Sarah M. was a natural in the outfield all season long. Senior Anna E. was the team’s most improved player this year. She was a very reliable catcher during the season. Next year the team will be even stronger with all the experience that this year’s junior class has. Junior Julia B. was the starting third base-woman and stepped in as pitcher in some games late in the season. Junior Maret Smith-Miller had another great year as our lead off batter and played a very solid second base. Junior Julia C. was amazing this year. She started the season off in the outfield and by end season she became a solid catcher. Julia C. also developed the skill of bunting this year. Junior Ariel G. played outfield and shortstop this year. Juniors Sage M. and Christeline V. were both great playing in the outfield for yet another season. Junior Airenakhue O. will continue to catch for BFS and play a key role on the team. As the season progressed our team got better and better. We won our first two games, then lost one, but quickly got back on the winning track. Then we lost two more, before going on a three game winning streak (where we beat our opponents by at least 12 runs in each victory). Then we lost two more games against very strong opponents. We picked up another two victories, including a very exciting come from behind win down at Red Hook on the final game of the regular season. We headed into the ISAL Playoffs for the third year in a row on a winning note. We won our league semifinal game and lost a an extremely well played softball championship game. This year’s team was comprised of five seniors ( Anna E., Sarah M., Chloe B., Julia G., Jillian F.), seven juniors (Julia B., Maret S-M, Sage M., Julia C., Christeline V., Airenakhue O., Ariel G.), four sophomores (Naya C., Sarah G., Sofia R., Taty R.,), and three freshmen (Maya W., Ivy L., Anna W.), as well as, two 8th grades (Fiona B. and Lucy S.). The seven juniors (Julia B., Maret S-M, Sage M., Julia C., Christeline V., Airenakhue O., Ariel G.), four sophomores (Naya C., Sarah G., Sofia R., Taty R.,), and two freshmen (Maya W., Ivy L., Anna W.), as well as, two 8th grades (Fiona B and Lucy S.) will be expected to make huge contributions next year as we lose this stellar senior class. Through continued hard work and dedication this young team will with out a doubt have great success in the future. This team full of young talent has a bright future ahead of them. We all look forward to more excitement out on the diamond. Blue Pride Runs Deep, Friends Forever!! 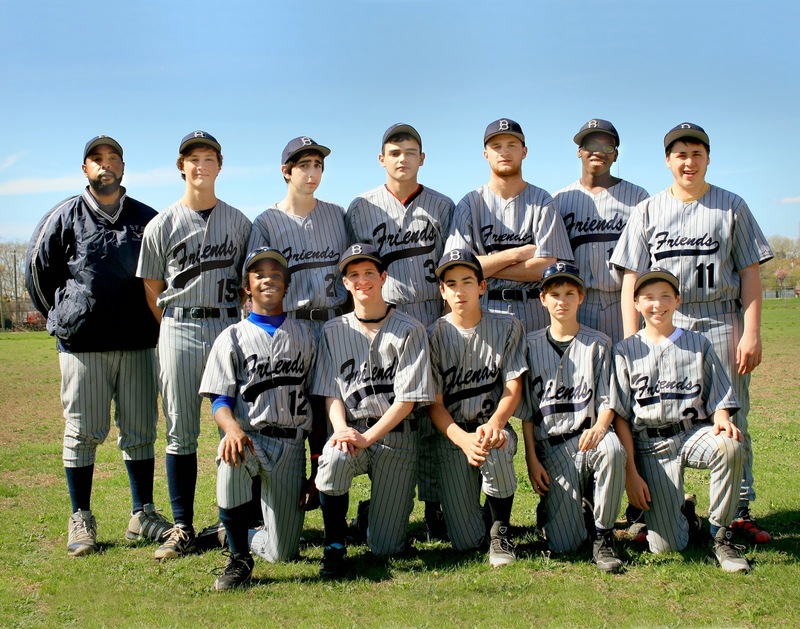 The 2014 Middle School Baseball team started in March with ten players on the roster, which set the foundation for a challenging, yet rewarding season. Most games this season found the Panthers playing a player or two down, but the team played very well despite the circumstances. The team posted two exciting last inning victories against UNIS and Lycee Francais. BFS came up short in exciting games against Berkeley Carroll and Friends Seminary. This season saw the return of Jackson W. to the mound, and the addition of Emmanuel B-S. to the pitching staff. The duo used their off speed pitching to catch batters off guard and tally many strike outs throughout the season. Catcher Jabulani C., provided leadership and encouragement behind the plate. Luca J. and John W. were a constant and productive presence at a variety of infield positions. Miles J-P., Jordan B., and Patrick D. did a good job covering the outfield. Chris K. and Ben B. also provided an offensive spark as well as pitching and catching relief throughout the season. This season was truly enjoyable. As always, the student-athletes represented BFS in an exemplary manner, while always having fun and learning the game of baseball. Blue Pride! 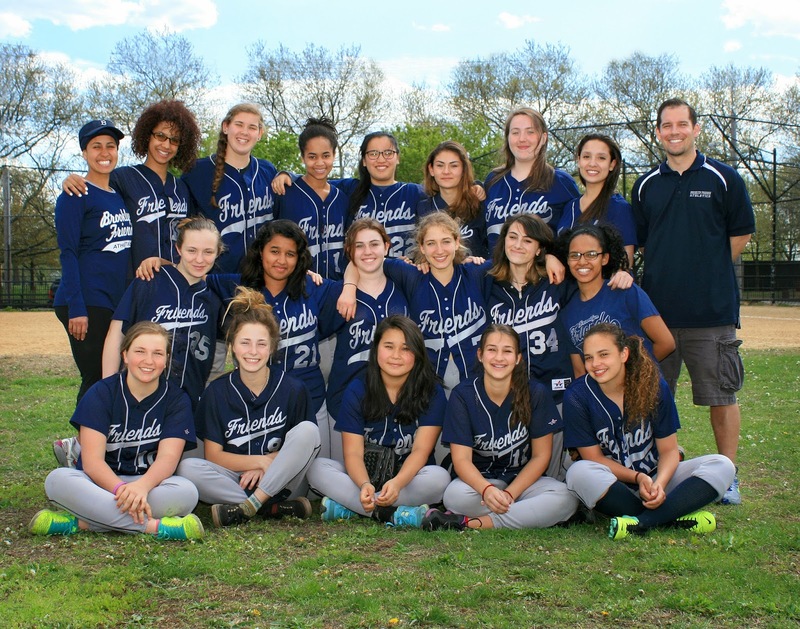 The Middle Girls Softball Team – we did not offer a team this season. 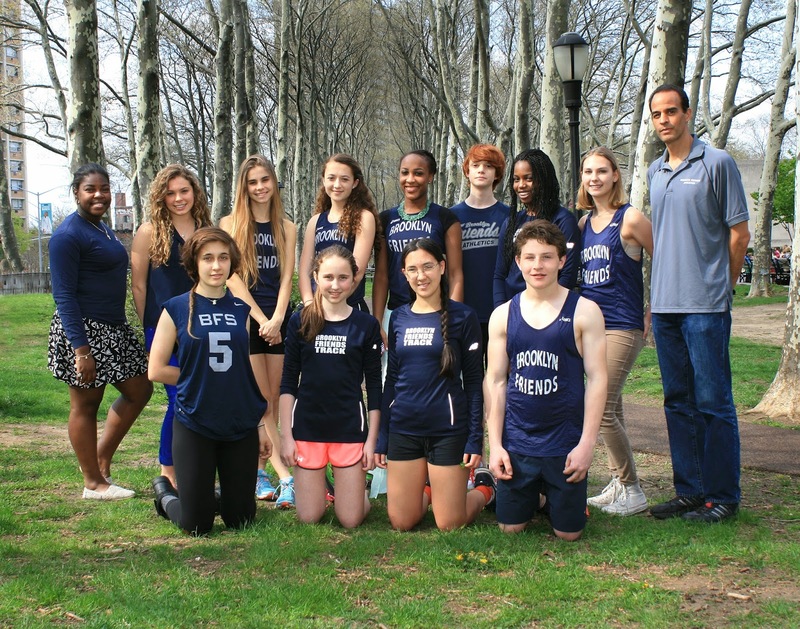 The Brooklyn Friends track and field team had a great turn out of runners for the Spring 2014 season. The nucleus of senior runners Elinor Hills, Tyler Clarke, Aria Cato and Sofia Schultz provided the team strong leadership and loads of enthusiasm. Our participation numbers were so strong we were able to field a number of relay teams for the season opening St. Ann’s Relay meet. The chance to compete in the relay races developed strong bonds throughout the team which carried them through an inspiring season. The chance to compete in both the ACIS and ISAL leagues provided the runners with abundant chances to race and explores different events. In one competition, Giovanna Molina, Jacob Iarussi and Maya Kaul ran the 800M which was a new race for them. The opportunity provided them the opportunity to explore new tactics and learn how their training prepares them for more than specialization in one event. Naomi Malcolm and Alexia Samuel were awarded the 110% award for this season. As freshmen, they demonstrated acumen for the sport and desire to improve. This focus will carry them to more success in future seasons. Along with our rising seniors, the team is well positioned to continue to make more strides to success. The MS Girls Track team had a great season. This season was about learning about the love of running, not competing. Most runners or athletes would never practice if they knew that they could not attend games and meets. Yet we had 2 runners who committed to joining our team, because they just loved to run and loved being around each other and the US track team. These girls truly embodied what BFS is looking to do, develop students who will love sport and physical activity for life. Kali has had tremendous growth not only in the course of this spring season, but over the course of the year. She has not only excelled on the track, but took on a new role by leading new runners on our team. She took this upon herself to help new runners get adjusted, motivate them, cheer them on, and teach them drills. Although she was not able to compete this spring due to other school obligations, she always gave it 100% anytime she came to practice and always was looking to get better. Kali had an amazing season. Helen excelled this year in running. She has improved tremendously and has gained the ability to run for longer periods of time. She has worked her way up to almost 45 minutes of running, learning to pace herself. She has become an inspiration to her teammates through her hard work, commitment and consistency in performance. Helen will surely be one to look out for in next year’s cross country team as she will start to place very high in league competitions! 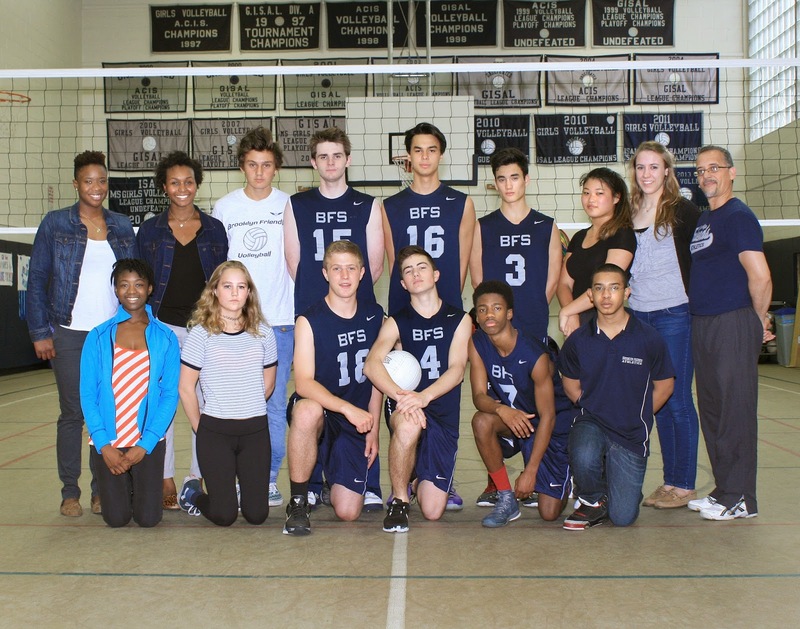 In our first season as part of the PSAA Boys volleyball league, our BFS team played passionately, energized, and determined to be the best team possible. After starting the season with a strong winning streak, we quickly climbed to first place of the Eastern Division, and finished undefeated with a perfect 10-0 record. It was, without a doubt, a season to remember for years to come. We presented a challenge to all our opponents, and won against all the teams we faced, ending the rewarding season with an overall 17-1 record and as Champions of the PSAA league. It was a total team effort for our small team of 7 players. Everyone showed great dedication, focus, and exemplary teamwork during each game. Every player played their role to the best of their ability, with the intension to improve and learn from each practice and game. Each match provided a great learning experience and feedback for our competitive and tight squad. Each and every player, juniors Thomas, Lucas, Griffin, Juan; sophomores Tyler and Quran; and freshman Philip, proved that a small committed team, willing to work hard, united, and focused can accomplish great goals. Thanks to our players, managers, coaches, and fans for the memorable season…Blue Pride! !